The luxury goods market is expected to grow at a compound annual growth rate (CAGR) of 3% to 4% through 2020. With rising standard of living across the globe, the luxury goods industry is poised to grow significantly, presenting innumerable opportunities for players in this market. If you are looking for a competent database to connect with key stakeholders in this industry, Blue Mail Media’s Luxury Goods Industry Email Database can meet the purpose well. We provide multi-channel marketing data that enables you to connect with your target group via different channels such as email, telephone and mail. Blue Mail Media has been a known name when it comes to delivering data of the highest quality. 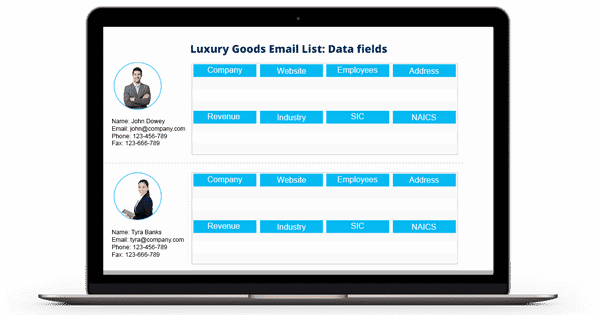 Our team of data specialists, marketers and professionals put in immense efforts in creating highly reliable email database of luxury goods industry executives. We collect data from all authentic sources and verified and update the same on a constant basis to maintain data accuracy. Blue Mail Media in past few years has created a strong network of data partners across the US, UK, Canada, North America, Australia, Europe, India, China, Russia, Africa among several other regions. This enables us to serve our clients without any regional borders. We give our clients immense flexibility to choose from our pre-packaged list of Luxury Industry Executives or opt for a customized list built on their marketing specific objectives.